Exploration of the North-West Coast of Australia, 1863. Title: Exploration of the North-West Coast of Australia, 1863. Authors: Charles Cooke Hunt and Joseph Beete Ridley; edited by Ned Overton. The sources of these journals and report are various issues of Perth newspapers published in 1863. Quotations from journalists are in a smaller font-size. The newspapers are available on the Trove website and the maps can be viewed on the website of the State Records Office of Western Australia. The name Nicol Bay, now Nickol Bay, has been left unchanged. Exploration and Settlement of the N.W. Coast. When Mr. Padbury first proposed to effect a settlement upon the scene of Mr. F. Gregory's discoveries on the North West Coast of this Colony, the Local Government agreed to furnish him with two persons competent to survey the coast, endeavor to find the southern entrance to the DeGrey River, and to further the exploration of the interior. With that view Messrs. Hunt and Ridley were engaged, the former as a navigator and draughtsman, and the latter to conduct the inland exploration. Mr. Hunt accompanied by Mr. Turner sailed in the cutter Mystery for the DeGrey some time prior to the departure of the Tien Tsin with the stock, in order to ascertain whether there was any suitable spot near that river where the stock could be landed, but failing in that returned to Nicol Bay and awaited the arrival of the Tien Tsin. We have been favoured with the Reports Messrs. Hunt and Ridley have made to the Government of their proceedings. We give those portions of Mr. Hunt's report, which are of general interest, and also extract * from that of Mr Ridley, those particulars of the nature of the country seen, which furnish what may be taken to be a fair idea of it, as regarding its capabilities for settlement. At the DeGrey itself no harbor or fair anchorage was found, but about 35 miles south of it, a very superior one was discovered, and although no surface water was found along its shores, the explorers are of opinion it may be obtained by digging, and if not, a river named the Dugald was found running seven miles to the E.S.E., which possibly would furnish the necessary element during a considerable portion of the year. The discovery of Mangrove Harbor,** which is of easy access, is a most fortunate circumstance, and on its shores will probably be formed the future principal township of that portion of the coast. The much dreaded spinifex proves not to be so great an impediment us was supposed, and it is not improbable the plant itself may prove to be worth exportation, possessing a strong fibre similar to hemp, and of it the natives prepare the string with which they make their fishing lines and nets. We commence Mr. Hunt's Journal, with his arrival at the Turtle Islands, giving each day's proceedings until the return to Nicol Bay where he was joined by the Tien Tsin, and we then pass on to the overland journey with Messrs. Nairn and Ridley from the Harding river to the DeGrey. 2. Extracts from C. C. Hunt's Journal. 3. J. B. Ridley's Report and Covering Letter, 1863. Appendix: Extracts from Ridley's Journal, 1863. A. SROWA 006: Plan of Tien Tsin Harbour (Port Walcott) by C. C. Hunt. D. SROWA 004A: C.C. 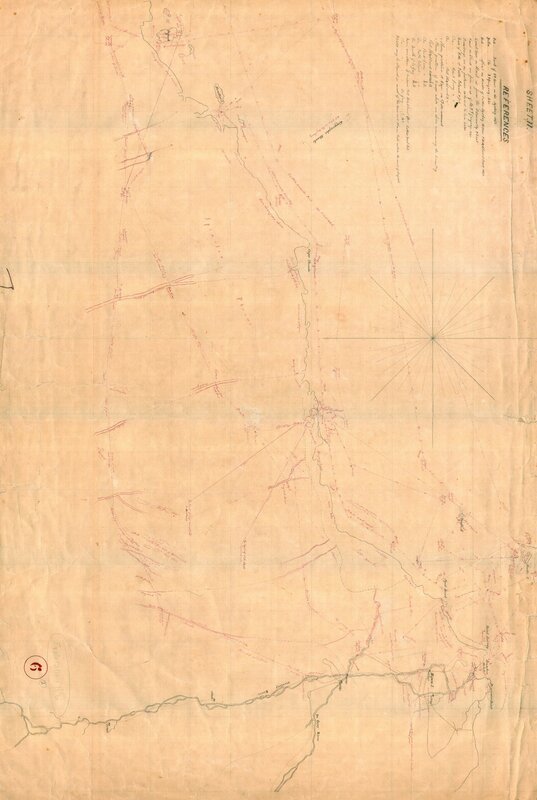 Hunt—Port Hedland, surveyed by C. C. Hunt, 1863. 2. Extracts from C. C. Hunt's Journal, 1863. Extracts from a Journal kept by Mr. Hunt on board the cutter "Mystery," and on the land journey from Tien Tsin Harbor to the DeGrey River. April 21.—Anchored off Little Turtle Island hear the mouth of the DeGrey. In approaching the island from the eastward care should he taken, as a considerable reef from S.S.W. to N.W. with deep water close to the rocks; the island is awash at high water spring tides. Many turtle near the reef. 22nd.—Anchored 3 miles off Point Larry, bearing S.E. by E.; the water from the last anchorage seldom above 1¾ fathoms. At 9 a.m. Mr. Turner and self went towards the river in a boat at half flood; found the deepest water towards Point Larry side, but seldom above 8 feet at three-quarter flood; the entrance of the river consists of a low sandy spit on the east side with [ ] at the back; on the west side the channel is somewhat deeper near the mangroves; above this the river trends S.E. by S. with deepest water on the west side with a bold shore. The current carried us towards Ripon Island at the rate of four miles an hour near high water spring tides. At 1 p.m. landed, but the country is so level could not see far; where the river trends to W. there is a fine reach of water with fully 5 fathoms, banks steep and rocky, but to reach this at any time would be impossible for anything but boats on account of the numerous shoals and sand spits. I observed what I supposed to be a native weir stretched right across the river, but I soon discovered my mistake, for the supposed weir was natives who rushed towards the bank carrying their nets with them, and were joined by several others; they all came running along the bank shouting and yelling, inviting us to land, which I did not deem it prudent to do, especially as I was doubtful about getting out of the river that tide; when the natives saw we were returning they called to their companions and pointed to where they thought we should stick for the night, but we got out and tracked the boat over the sand bank; the natives seemed disappointed, but 26 of them continued to follow us; they appeared to be a fine lusty body of men, carrying no arms, but there were more of them a quarter of a mile back probably trailing their spears if they meant mischief; they followed us about four miles to the edge of the mangroves. Many of the banks in the Inlet were dry at half ebb and the breakers within a mile of the cutter. 23rd.—Sailed for Turtle Island to examine the state of the anchorage; found reef at high water to have little more than a fathom upon it; the island is little more than a sand heap covered with coarse grass above the influence of the tide, and the abode of immense numbers of pelicans and other sea birds, with whose eggs we could have loaded the boat. On the east side of the island there is good water, 6 to 10 fathoms within 3 miles; anchored in 6 fathoms, coarse sand, half a mile E. of reef, island bearing 2 miles W. by S. ½ E. I do not consider it safe for any vessel to approach nearer than two miles even in the calmest weather. 24th.—Examining the coast for the western outlet of the river; the shore all round the bay from Spit Point to Point Larry is thickly covered with mangroves with tolerably clear sand hills at their back. In the afternoon stood along the coast west of Spit Point, where the mangroves cease and the sand hills stand out to high water mark. No opening to be seen. 25th.—The breakers extend from Little Turtle Island W.S.W. for about 7 miles; took an inner passage, and stood in for what I supposed to be an inlet and anchored in 3½ fathoms one mile from the shore; started in the boat to examine the place and found it to be of some consequence, being well adapted for a harbor for a considerable number of craft, the soundings from the cutter to the entrance shewing 4 to 11 fathoms. One mile S. by E. took us into the Inlet and a quarter of a mile S. brought us to an inner harbor more spacious and safe than the outer one; a course from this entrance S.E. by S. 1¼ miles and S. by W. half a mile up a creek took us to the main land where the creek trended to the E. and narrow; we found good landing free of mangroves, walking a few hundred yards south of the head of the creek, the country as far as we could see appeared to be an immense spinifex plain, with a few trees far away to the south; we landed in two or three other places to find water but without success; if that could be found, this would be an excellent place to land stock in, well sheltered from every wind and ample water for a vessel of 500 tons, although the entrance is narrow it has good soundings. It is in Lat. 20deg. 19min. S., Long. 118deg. 30min. E., bottom sand and mud. 26th.—Coasting to westward towards Cape Thouin within two miles of the land; numerous mangroves for a few miles E. of the Cape, but too shallow to approach with the cutter. Most of the points as headlands along this line of coast seem to be divided from the mainland by mangrove creeks cutting them off at the back. 27th.—Anchored off Forestier Island, 2 miles E. ½ S. from E. end, in a good anchorage for small vessels, a remarkable red hill brought to bear S.E. by S. ½ E. will take them through the passage clear of rocks, and the anchorage is covered from all winds but N.W. 28th.—Mr. Turner went in the boat to examine the mangroves along the shore for an opening that might be the Yule, but found them to be merely small creeks with shallow water. Landed on the east end of island to look at the coast line to the south; found it to be lower than that passed the last two days and the shore covered with mangroves, apparently backed for two miles by salt marshes. Forestier is, like Turtle and other small islands in these seas, sandy and covered with a coarse grass or spinifex; saw nothing but the track of a native dog—how did he get there? 29th.—Standing for Depuch Island; anchored in 5 fathoms, quarter of a mile from shore on the S.E. side of the island, safe from all winds but N. and N.N.W. 30th.—Landed with Mr. Turner and made an unsuccessful search for water, the ravines however shewed signs of there having been a considerable rush down them a few weeks back. Ascended to the highest point (perhaps 300 feet) composed of metamorphic sandstone, and had a good view of the main land beyond the mangroves. This island appears to be of the same formation as Dampier's Archipelago, except that we found a sort of coarse lava in the gullies. We noticed some small gum trees had been cut down a few years ago; rock kangaroo and native dogs abound. Plan of Tien Tsin Harbour (Port Walcott) by C. C. Hunt. From this date to May 17, we make no extracts, the events having been previously recorded in Captain Jarman's Journal; heavy rain fell on the 14th and 15th, and a flood came down on the camp during the night causing great damage to the stores, spoilt most of their cartridges. ...21st.—Mr. Ridley, Mr. Nairn, Dugald (the native), and myself started for the DeGrey; the country passed over is fine grassy land but very boggy. Camped on the west branch of a stream I suppose to be the George. 22nd.—At 9 miles struck the junction of the George and Sherlock, at this time running rapidly, but had fallen 8 feet since the last rains, trending N.N.E. and about 400 yards broad; 9 miles further brought us to the bank of a considerable river running strongly; the day's march has been over fine grassy level plains. 23rd.—Struck along the west bank of the river for about five miles to find a ford, and travelled over a generally well grassed country but rather boggy, the soil is alluvial, and also that seen the previous two days. 25th.—Struck towards a pass through the ranges, trending S.S.E. from Depuch Island: found the country through the hills stony and but poorly grassed; at a ¼ past 10 had an extensive view from a peak 300 feet high to the East northerly over a vast plain apparently covered with spinifex or scrub; at 3.30 p.m. crossed a small stream bed trending N.N.W., at 5 p.m. crossed another and halted at a fine pool 100 yards broad and half a mile long; country passed over since leaving the range is alluvial with spinifex and scrub, Lat. 20deg. 35min. S. Long. 118deg. 12min. E.
26th.—At one mile crossed a small stream; at 3.40 p.m. crossed a shallow river bed 400 yards wide, running rapidly, probably the Yule, trending towards Cape Thouin; halted at a clay-pan with flooded gum trees. Distance 20 miles, almost all spinifex. 27th.—Crossed stream bed 300 yards wide, still running Lat. 20deg. 32min. Long. 118deg. 26min. ; passed ridges of white quartz running for 2½ miles, and halted at Long. 20deg. 26min. 28th.—At 4 miles struck a small running stream bed and another shortly after; camped at a salt creek at the back of Mangrove Harbor,* saw some natives and found some of their weapons in an old camp. 29th.—Crossed two stream beds before half past 10 a.m., and in the afternoon another with water in small pools, and shortly after the country much improved with good grass and alluvial flats. Five natives followed on our tracks making signal fires. Halted Lat. 20deg. 14min. 28sec. 30th.—Shortly after starting met a party of armed natives, and the hideous yell they set up made one of the pack horses bolt, and Dugald went to recover it, upon which the natives supposing he was running away, came threateningly forward within 50 yards, when we fired a shot over their heads, which startled them, and three of us galloping up they scampered off to the hills holding their shields behind them; at 9.30 a.m. struck the western branch of the DeGrey near the head of Ripon Island; fine feed near the banks superior to any I had previously seen; the river here has a broad sandy dry bed; travelled down the river and camped on the plains four miles from N.W. corner of Ripon, country fine open grassy plains. 31st.—Passed on through sand and hills to Point Larry and then southwards to west side of Spit Point beyond the mangroves where we intended to halt, but finding no good water pushed on 6 miles S.E. and camped at a clay-pan in an open plain with fine grass. June 1st.—Started for what appeared to be a lake but proved to be only mirage; course S.E. by E. across the plain and along the bed of the river, at noon halted at a fine pool, deep, but difficult for stock to get down to the water, quantities of ducks, abundance of grass; struck the junction of the DeGrey and the Strelley, and following up the latter passed the north end of Magnetic Hills, the country again becoming poor and sandy, that between Points Larry and Spit and Magnetic Hills is of first rate quality; the deep creek seen by Mr. F. Gregory discharges itself into salt marshes about 6 miles west of Spit Point. 2nd.—Course S.S.W. ; halted Lat. 20deg. 38min. 31sec., Long. 118deg. 56min. 30sec. ; country sand hills and scrub and to S.W. dwarf gums and spinifex. 3rd.—W.S.W. During the day passed over a broken poor country, in 3 hours crossed as many stream beds coming from the range before us; at 10.30 in the hills passed a fine patch of grass, and several red kangaroo in sight; at 12.45 halted for the day at a brook in the ranges with good feed and water. 4th.—W.S.W. In three hours crossed stream bed and at noon halted at another, the country passed over being very rugged with small patches of grass and spinifex; afternoon course W. by S., crossed stream bed 200 yards broad, cleared the hills and camped in the plains. 5.—Due West. At 3½ hours crossed the Yule, here a quarter mile broad with good stream of water; halted at noon on the west branch. 6.—W. ½ N. over spinifex plains until 9.45 a.m. then W. passing over two stream beds with country well grassed. 7.—Struck our camp of May 24 at a clay-pan where we had burned a large patch of spinifex; this day we found that on the burned ground the grass had grown the almost incredible length of 14 inches—1 inch per day, a sort of flaggy grass much relished by the horses; camped at night in our old camp on the Sherlock, which river we crossed without much trouble. 8.—From the Sherlock to the Harding; found the country sufficiently dried up for the teams and stock to cross. 9.—Camp. Found all well; a camp of 26 natives within a mile. 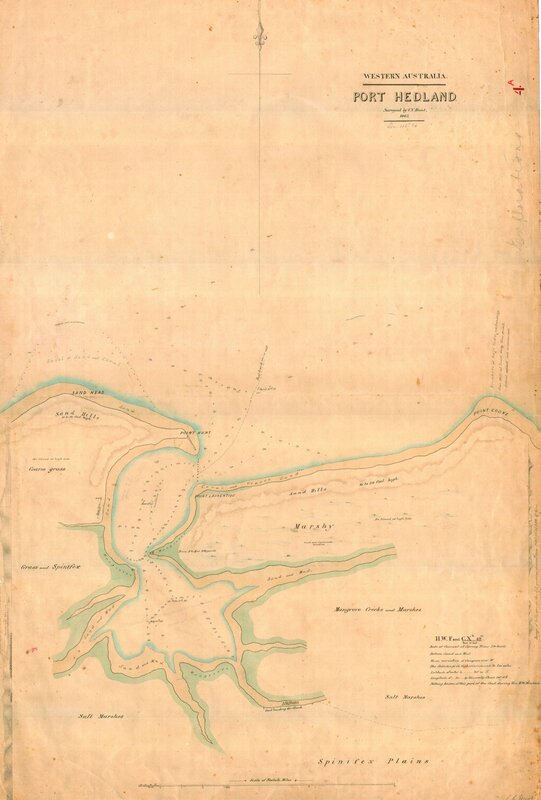 From this date until the 23rd June, the Journal contains nothing of general interest; Mr. Nairn then left with the stock for the DeGrey, and the writer in the Mystery for the north, and anchored on the 25th in Mangrove Harbor; of this excellent harbor a perfect survey was made and the outer portion named Port Headland. On the 28th the cutter anchored at Turtle Island, and on the 4th July the overland party made their appearance on the beach at Spit Point, and Mr. Hunt then accompanied Mr. Nairn back to the stock which was slowly travelling up. The sheep, and cattle were found south of the Yule, in good condition, although the ewes had been dropping lambs ever since leaving the Harding, and all safely reached the DeGrey on the 28th, locating a little west of Ripon Island. On the 25th commenced the task of getting the Mystery into the DeGrey, which was not accomplished until the top of spring tide on the 29th with no little amount of pulling and heaving, she was then moored to the bank of Ripon Island and commenced discharging. All was ready by the 6th August for her going to sea, but although drawing less than five feet, she did not get out until the 13th, when she sailed for Fremantle. 3. J. B. Ridley's Report and Covering Letter to the Colonial Secretary, 21 September, 1863. Sir,—Subjoined I have the honor to forward, for the information of His Excellency the Governor, my report of proceedings from the time of my departure from Fremantle for Nicol Bay, on the 25th of last April, to my return on the 15th instant, as connected with the late projected expedition to the southward and eastward of Breaker Inlet, on the north western coast of this Colony, being chiefly an abridgement of my daily journal, with remarks thereon; and deeply regret, both on public and private grounds, that circumstances, and I must add some of the arrangements subsequent to my departure, and over which I had not the slightest control, should have tended to render the time spent so comparatively barren of satisfactory results. A fair copy of my journal, the pencil marks of great portions of the original being nearly obliterated, I hope to have the honor of forwarding by to-morrow's post. The Hon. the Colonial Secretary, Perth. An exploring party, consisting of five persons, having been organized by the Local Government and Mr Padbury, for the purpose of more fully examining portions of the country on the north-west coast of this Colony, discovered by Mr Gregory in 1861, and afterwards pushing out either from Nicol Bay or Breaker Inlet in the direction of, and reaching if possible, the Fitzroy River, determining thereby the existence or otherwise of a large river, supposed to empty itself into the sea in the vicinity of Lagrange or Roebuck Bays, as also of additional pastoral country; exploring inland as far as time and other circumstances would permit. I received instructions from the Colonial Secretary's Office to proceed to Nicol Bay, for the purpose of taking the command, and left Fremantle on the 25th of April, in the barque Tien Tsin, which vessel had been chartered by Mr Padbury, for two trips, to convey stock either to Nicol Bay, Breaker Inlet, or any intermediate spot which might be found to afford greater facilities for landing, watering, and for the stock subsequently proceeding to any spot that might be fixed upon for the first station. Mr Padbury was desirous that this should be on the DeGrey River if possible. Mr Hunt, who, in addition to myself, proceeded on account of the Government to form one of my party, and act as Navigator and Draughtsman, left Fremantle twenty days prior to the Tien Tsin's departure, in Mr Padbury's cutter Mystery, for the purpose of examining (as closely as time and other circumstances would permit) the coast line between Nicol Bay and Breaker Inlet, with the view of landing stock as above alluded to, leaving on his way up a letter buried at the foot of a flag-staff on the south end of Delambre Island, and with instructions to await the Tien Tsin in Nicol Bay, should he return to that place before her arrival from Fremantle. Mr Padbury accompanied his party (in the Tien Tsin), and shipped 537 sheep, 11 horses, and 6 working bullocks, the first voyage, with a party consisting of five whites, and five aboriginal blacks, four of the latter having been furnished by the Government from the Penal Establishment at Rottnest Island. After a pleasant passage, during which only two sheep were lost, the Tien Tsin dropped anchor four or five miles north of Delambre Island, when Captain Jarman, the second officer of the Tien Tsin, Messrs. Samson, Nairn, a seaman, and myself, left the vessel in one of her gigs for the nearest part of the beach, but, owing to the precipitous character of that part of the Island, were unable to effect a landing, but after experiencing some little difficulty in getting through the broken water, and "tracking" the boat for a considerable distance over a reef, which extends along its south-western side, accomplished our purpose shortly after daylight near the south end of the Island, from which the flag-staff planted by the Mystery's party was plainly visible, about half-a-mile distant. Upon reaching it, and digging up the bottle containing the expected letter, we learned that the cutter had returned from Breaker Inlet two days previously, and had sailed for Hearson's Cove, near the head of Nicol Bay, (16 or 20 miles), for water, whither we proceeded, and assisted in completing the watering, which was not accomplished until shortly after dark, in consequence of its being low water, and the casks having to be rolled for more than half-a-mile over mud and sand. During high water the boat could be taken to within less than two hundred yards of "Gregory's Well," from which the water was procured. About eight p.m., we weighed anchor and stood out for the Tien Tsin, which was reached shortly after midnight, when Messrs. Hunt and Turner (the latter forming one of Mr Padbury's party in the Mystery,) accompanied Captain Jarman on board to report to Mr Padbury the result of the voyage. Before proceeding farther it may he as well to remark that the streams near Hearson's Cove, from which the Dolphin procured an abundant supply of good water the year before last, in the month of October, was then (though four months earlier in the dry season) completely dried up, and the pools in its bed, about two hundred yards from the beach, quite salt. "Gregory's Well" contained but a small supply, four hogsheads per day being all that was then procurable, and before the end of the dry season would, in all probability, be quite dry. From the fact of its being close to the beach, but little (if at all) above the level of the sea, under the narrow belt of hills immediately behind it, backed by extensive salt marshes, I should fear that a further sinking through the bed of clay on which the fresh water rests, would only result in its loss, or the addition of salt; and for the same reason the almost perfect continuity of the salt marshes lying immediately behind the very narrow ridge of sand-hills, which form by far the greatest part of the coast-line between Breaker Inlet and Tien Tsin Harbour, and through which various mangrove creeks allow the free ingress and egress of the waters of the sea, caused by the rise and fall of the tides, which at the spring amount to eighteen or twenty feet, would, I consider, preclude the probability of fresh water being obtainable by means of wells along that portion of the coast on the sea-side of the marshes. On the southern side of the marshes and mangrove creeks I did not perceive the slightest indication of salt either on the land or in the water throughout the country lying between Tien Tsin Harbour and the DeGrey River, though pretty well examined throughout the entire length and from between 10 to 30 miles of the coast inland. The Mystery's party, on the return from Breaker Inlet above-mentioned, saw and partially examined a harbour about thirty miles to the westward of the DeGrey River, which has since been twice visited, and found to be an excellent anchorage, though not very extensive, perfectly landlocked, and therefore secure from all winds. It has been named Port Hedland, after the master of the Mystery, who first perceived the entrance to it. A practicable route for driving stock to the DeGrey from thence has also been found and a good landing place on firm ground above the marshes, to which spot boats of any size could convey stock during high water. The weakest of the sheep, when were nearly all in very low condition when shipped, were now beginning to show the effects of the confinement, five or six having died during our absence in search of the cutter, and as the report brought by Messrs. Hunt and Turner was not considered sufficiently encouraging to induce the risk of a trial of landing at Breaker Inlet, and nothing being then known concerning the character of the country in the vicinity of Port Hedland, the stock were landed at the head of a bay, immediately on the eastern side of Cape Lambert, during this 6th, 7th, and 8th of May, (the bay having been entered during the afternoon, of the 5th.). 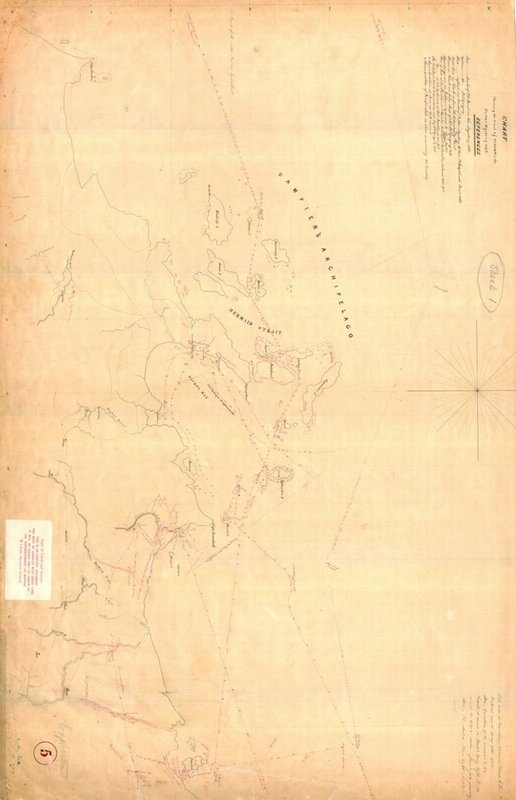 This bay not having a name on the Admiralty charts was called Tien Tsin Harbour; an island forming part of its eastern side, Jarman Island, and an inlet near the south eastern head, Butcher Inlet, after the vessel, captain, and chief officer respectively. But as this harbour, together with Port Hedland, Breaker Inlet, and other parts of the coast visited, will form the subject of a special report from Mr Hunt, it is unnecessary to say more than that both the harbour and inlet afford good shelter for vessels, and possess excellent facilities for landing stock; the latter particularly. Fresh water can be procured in the sand hills at the head of the bay, for a month or six weeks after any heavy rains, beyond which time it becomes brackish, and a much longer continuation of dry weather renders it unfit even for the use of stock. I do not think that a permanent supply of fresh water will ever be obtained at this harbour, except from tanks, the marshes there not forming any exception to the general rule, but, on the contrary, remaining rather closer than usual to the beach, and very extensive. The day after our arrival I walked about 5 miles inland, accompanied by James McCourt (one of Mr Padbury's party) and the free native Dugald, and fortunately struck a river, which was afterwards found to be the principal branch of the Harding, (not seen by Mr Gregory,) with a fine reach of water upwards of two miles in length, and fifty or sixty yards wide, and having abundance of grass on wide alluvial plains on its banks. To this place the stock were removed on the 9th May, a few weak sheep and one bullock having died on the way, owing to lowness of condition and the effects of the brackish water which they had drunk after landing. 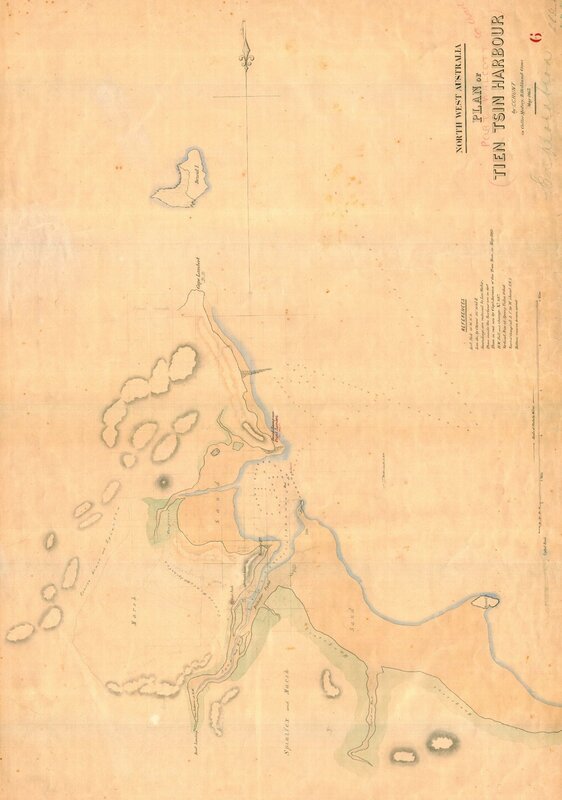 Port Hedland, surveyed by C. C. Hunt, 1863. Mr Padbury, wishing to see a little of the country before returning to Fremantle in the Tien Tsin, Captain Jarman and himself, with Messrs. Samson, Nairn, and Turner, made a two days' excursion into the country, while Mr Hunt and myself examined Butcher Inlet and the mangrove creeks running into it, with a view to finding a passage to firm ground above the marshes where goods for the station might be landed, in which however we were only partially successful. On the morning of the 11th May the Tien Tsin sailed for Fremantle, for the second lot of stock, Captain Jarman and Mr Padbury having the previous day arranged with Mr Nairn, (Mr Padbury's brother-in-law) who had the direction of Mr Padbury's affairs during his absence, that in the event of the cutter's leaving the harbour for any purpose before the Tien Tsin's return, a letter should be left in a bottle buried on the eastern side of a cask sunk in a small well in the sand hills, from which the stock had been watered on landing, though at what distance from it or depth in the ground (if any such things were particularly specified) I am not prepared to say, not having been present when the matter was settled. During the forenoon of the day of the cutter's departure for Turtle Island and Spit Point, (23rd June) the same day on which the stock left for the DeGrey, the master having received the order from Mr Nairn, I accompanied him to the above-mentioned cask, and assisted in burying a bottle containing letters for the Tien Tsin's party, informing them of the plan of operations proposed by Mr Nairn, occurrences since his departure, and the place where the cutter would in all probability be found, viz, Turtle Island or Spit Point. Mr Nairn, in my presence, simply directed the master to bury the bottle on the eastern side of the cask, which was done, the bottle being left in an upright position, touching the eastern side of the cask, with the cork twelve or fourteen inches beneath the surface. I have been thus minute in describing my knowledge of the affair, as the abandonment of the projected expedition to the southward and eastward of the DeGrey is attributable to the Tien Tsin's party not being able to find the cutter, (owing to the non-appearance of the letters when searched for) as Mr Nairn could spare me only one native, instead of the three men that Mr Padbury had engaged to furnish, until his party was reinforced, which he expected it would have been on the arrival of the Tien Tsin. It is much to be regretted that an arrangement involving such serious consequences should not have been committed to paper. A considerable difference of opinion appears to exist among those who were present when the matter was discussed, as to what really was specified and agreed to. It being proposed in my instructions, that a short trip into the country should be undertaken during the Tien Tsin's absence on her second voyage, preparatory to the departure for the Fitzroy River, I prepared to start for the purpose of examining the country from Tien Tsin Harbour to the DeGrey River, between the coast and Mr Gregory's route, which, for a considerable part of the distance, was thirty or forty miles inland, but was detained nearly a week in consequence of a heavy fall of rain on the 13th, 14th and 15th May, which flooded the rivers and rendered the country exceedingly boggy. On the 21st I left the camp on the Harding for the DeGrey, accompanied by Messrs. Hunt and Nairn and the native Dugald, although the country was still exceedingly soft, and was absent three weeks. The improvement perceptible in the condition of the stock during that period was almost incredible; the bullocks, that five weeks before had been, landed in low condition with rough coats, were now sleek and shining, and by no means despicable beef. The sheep had also improved in the same proportion, proving that the grasses possess the requisite properties for speedy fattening. For the first forty-two miles eastward of the camp on the western Harding I found the country to be an almost unbroken very open grassy plain of stiff alluvial soil, lying between the first range of hills and the coast, and extending from their base to near the edge of the salt marshes, and crossed by the Harding, George, and Sherlock of Gregory, and also by the main branch of the Sherlock (missed by Mr Gregory when following down the western branch to its junction with the George) and by several other considerable water-courses. In three of the above-mentioned rivers I believe that permanent water will be found, but as they were partially in flood when passed I cannot speak with any degree of certainty. The average width of the plain I estimated at ten miles which Messrs. Hunt and Nairn considered too low. It is bounded on to the East by a spur of the range which extends nearly to the coast a little to the eastward of Depuch Island. To the eastward of this spur, through which there is a good pass, the main body of the range gradually recedes from the coast being at the Strelley river (the most eastern part seen) nearly forty miles distant. Nearly the whole of the large extent of country lying between, nearly ninety miles in length, and varying from ten to nearly forty miles in width, may almost be termed one vast spinifex plain, the soil principally being a coarse sandy loam, with a few groups and isolated rocky hills, the greatest number of which lie towards the north-eastern extremity and are composed of a dark rock of volcanic origin, while those seen near the south-eastern are principally a very coarse grained light coloured granite. Several large water-courses in addition to the Yule river cross this plain, some of which I have no doubt contain permanent water if appearances are to be trusted. Some very tolerable sized patches of much stronger land bearing excellent grass were also seen (and I have no doubt others will be found) which will be found exceedingly useful as shifts for flocks of sheep in the event of the country becoming stocked. Should the spinifex land be found capable of producing sufficient pasture for stock during the short time that the lower and more clayey grass plains are too wet and soft, (which I feel confident would he the case, due attention being paid to burning at the proper times) these patches of grass will be doubly valuable as affording variety of food, so desirable for all descriptions of stock. It would be premature to give a decided opinion as to whether the climate will affect the growth or fineness of the wool in any serious degree, until the effect upon the sheep of the hot wet season has been observed. Should it not be found particularly injurious, either to the growth of wool or the general health of the stock, I have no hesitation in expressing my belief that the grassy country is capable of carrying a percentage of stock very considerably above that of the best of the settled districts of the colony, both on account of the quantity of grass, as also the very much longer period during which it continues to grow, owing to the dry season being also the cool season, having its periodical rains and heavy dews, (if this season can he taken as a fair average). For the same reason a much smaller quantity of water would suffice for the use of the stock both on account of the comparatively trifling evaporation and the much smaller quantity which they would consume. Tanks for containing water to any amount could be made in nearly any of the grassy land for the trouble of digging out, the soil being admirably adapted for the purpose; a little puddling might be required in some instances. Judging of the country described by Mr Gregory which I have not seen, by that also described by him which I have had an opportunity of examining, I consider that sufficient pasture has already been discovered for several hundred thousand sheep, or a proportionate number of large stock within an available distance of the coast, and an immense field on the rivers and plains in its immediate vicinity for the cultivation of cotton, tobacco, and other inter-tropical productions, with one of more extent and promising to the northward and eastward still unexplored. The weather during the whole of my stay (between three and four months) was with the exception of a few rainy days, almost invariably delightful, the days cool and refreshing, and the nights cold and bracing. Small flies were found rather troublesome, more particularly very near the coast but mosquitoes not nearly so much so as on the Swan. All timber required for substantial buildings would have to be imported, the only kinds the country produces being the flooded gum, cajeput, and a species of acacia, all of which are to be found only in the beds of rivers or other water-courses and on their immediate banks, and are very inferior. Stone for building purposes is plentiful wherever there is a hill. For most other purposes they (the hills) are useless, being invariably barren, generally abrupt masses of rock, bearing spinifex round their bases and wherever they are capable of bearing anything. Limestone was not found by any of the party during my stay, though sought for. Many (to me) new flowers and plants were seen, some of which were very beautiful, but the hurried nature of the trip precluded the possibility of collecting and drying any at that time. Kangaroo and all other animals (mice and native dogs excepted) are very scarce. The natives do not appear to be more than usually numerous or hostile, and will not I imagine offer even the usual amount of obstruction to the settlement of the country. The principal food of those within reach of the coast appears to be fish. Nearly every one carries a net, some of which are funnel shaped and others resembling small stake nets, made of a two stranded twine which they manufacture from the fibre of some variety of the spinifex. The knot is the same as in ours, and they could not be distinguished from each other except on close inspection. Neither the men or women appear to possess the smallest article in the shape of covering. On the 23rd of June, Mr Nairn having decided upon not waiting any longer for the Tien Tsin, which was now a few days overdue, started with his party and struck for the DeGrey, which he did not expect to teach in less than a month or five weeks, as many of the ewes had yet to lamb. He directed the matter of the cutter to sail on the same day, and meet him on an appointed day at Spit Point. Fearing that by accompanying the land party, I might lose the opportunity of replying to any letters or instructions received by the Tien Tsin, I sailed in the cutter, (as did also Mr Hunt,) having first accompanied the master, and assisted in burying a bottle containing letters, as before described. From that date to the 30th of July,* on which day the cutter commenced discharging cargo in Breaker Inlet, for the use of the station party on the DeGrey, (the sheep having arrived two days before, after a very satisfactory journey on which only two lambs were lost,) we had seen lying alternately at Spit Point, Turtle Island, and Port Hedland, and twice had communication with the overland party. On the 13th of Aug., the goods were all carted to the station on the DeGrey, and orders previously received by the master from Mr Nairn for the cutter to sail with all despatch for Fremantle for provisions, inferring from the non-appearance of the Tien Tsin that some accident had occurred, or change in the arrangements taken place. As Mr Nairn was unable with any degree of safety, to reduce his party by furnishing more than one native for the exploring party, there was no alternative for Mr Hunt and myself to return in the cutter, or await her return, when it would have been too late in the season to have attempted a start with the slightest prospect of success. We therefore made up our minds to return, not a little disappointed and disgusted at the turn things had taken. Alter a rough passage of thirteen days, we arrived at Fremantle on the 15th instant, and were released from our eighty-two days life of comparative misery having been without meat (one sheep excepted) unless procured by chance, but rarely able to obtain the means of washing our faces, while our floating prison swarmed with most unpleasant passengers, in the shape of bugs and cockroaches; our only pleasure being derived from the kindness and attention of the master, Mr P. Hedland, who, together with the crew, every strove to make matters as smooth as possible under the circumstances. For further details of parts of the proceedings described in the foregoing, I desire to refer His Excellency to my journal of daily occurrences. "June 25.—At 2.30 dropped anchor in the mangrove inlet discovered by the Mystery's party during the late trip to the DeGrey, and which Mr Hunt now named "Port Hedland," after the master, he having been the first to discern the entrance, which lies between a small rocky point projecting from a sandy beach on the western side, and a more sandy point on the eastern, at the head of a shallow bay or indent; the channel varying from 11 to 4 fathoms for about three quarters of a mile seaward, from which it gradually shoals to about one and a half fathoms (low water) on the bank, marked on the Admiralty chart, between one and two miles from the shore. A few hundred yards inside the above-mentioned points we passed over a narrow bank, apparently the bar of the inlet, having about 5 feet of water on it: immediately inside of which it increased to 6, 7, and 8, fathoms; the inlet turning to the eastward and opening out into a fine sheet of water of an oval shape, the longest way being E and W, with several large mangrove creeks to the Eastward, Southward, and Westward. Continued S. of E. for about a mile inside of bar, and dropped anchor in 3½ fathoms (sand and mud). The western point of entrance being completely shut in, the harbour from our present position has the appearance of an inland lake, and is perfectly secure from any winds. Went in the boat with the Master and Mr Hunt in afternoon to different points for bearings, &c.
Propose making a fuller examination to-morrow. All the depths given above are low water soundings. June 26.—Went in boat with Messrs. Hunt and Headland to examine the entrance to the harbour, found that what we yesterday took for the bar was only a narrow sand-bank, a few yards in width, running diagonally across the centre, with a channel on either side upwards of a hundred yards wide, carrying 4, 5, and 6 fathoms at low water. Landed on eastern side of entrance, and saw three natives fishing in the surf, about ½ a mile to the eastward of us. Wishing to ascertain if possible the whereabouts of fresh water, as also of pearl oysters (which at Tien Tsin Harbour they call weerdie,) Mr Hunt, a man and myself advanced to meet them, they having commenced coming towards us; making friendly signs similar to those used by the natives seen since our arrival on the coast, as we went on, which they returned, but their courage failing them when within two or three hundred yards of us, they made off for the sandhills, and as they continued to retire as we advanced, we gave up the attempt and crossed over to the western side and dug a hole in the most likely looking hollow among the sand-hills, which however caved in just as the sand was becoming very moist. Fresh water is in all probability to be found here at this time, though for the same reasons as before stated with regard to Hearson's Cove, and Tien Tsin Harbour, viz., the proximity of the marshes on the land side, I do not believe that a permanent supply will ever be obtained from wells. Some pieces of shells of the large pearl oysters, similar to those found by the Dolphin's party at Nicol Bay, were picked up this morning. July 15.—Messrs. Headland, Turner, and myself with two of the Cutter's men examined two of the southern mangrove creeks and found the cutter could if necessary go about two miles up either of them and land stock from her deck during high-water on to the spinifex plain, to all appearance quite clear of the marshes. July 16.—Mr Turner and two of the cutter's men went to the overland track, and buried the letter for Mr Nairn apprising him of the cutter's arrival here. Party returned about sunset, having travelled the whole distance to the track (which they struck about three miles to the N. E. of the quartz hill passed by Messrs. Hunt, Nairn, and myself on 27th May,) on our overland journey to the DeGrey, over firm ground, and passed one or two water-courses the nearest of which is not much more than a mile from the head of the creek, in which water will be procurable for some weeks if even it should not rain. The fact of the line between the head of the creeks here and the DeGrey River being both practicable and easy for stock driving, is now determined most satisfactorily. From the the masthead, as also from the plains at the head of the creek, we can now see that this port is about four or five miles further to the westward than it was supposed to be when Mr Hunt and myself endeavoured to reach it on the 28th May, which is fortunate, as it is very doubtful whether the marshes, then seen, could ever have been crossed by large stock." Introduction; Hunt's Journal: From The Perth Gazette and Independent Journal of Politics and News, Friday 25 September 1863; Trove articles 2934644/722629. Ridley's Report: From The Inquirer and Commercial News, Wednesday 30 September 1863; Trove article 66014617. Part of the report is also contained in source of Hunt's journal. Appendix: From The Inquirer and Commercial News, 4 November 1863; Trove article 66013269. 006: C.C. Hunt—plan of Tien Tsin Harbour (Port Walcott), May 1863. 005/1 C.C. Hunt—chart showing the track of C.C. Hunt in the Cutter "Mystery", 1863 (Cape Preston to Gantheaume Bay). 006A: C.C. Hunt—explorations eastward of Nicol Bay, 1863. 004A: C.C. Hunt—Port Hedland and surroundings, 1863.